“Here’s a beautiful Roland SH-1000. There are some obvious signs of age because this is Roland’s first synthesizer and is almost 50 years old. Completely functional. All sliders, pots and switches have been cleaned. No scratchy noises! 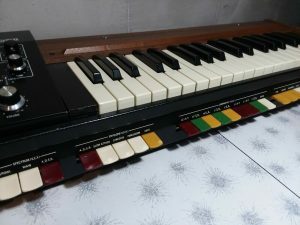 Roland (solely a Japanese company at this time) came up with this VERY nice basic analog synth in 1973. This was THE sound that made the Steve Miller Band “Fly Like An Eagle” album an immortal classic. I can remember being completely astonished the thing got the sounds it could in a completely easily-portable package- you could (still can) play this comfortably on your lap. 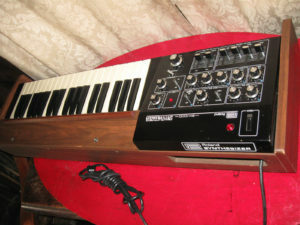 It couldn’t do all that a mini-Moog could (signal routing is essentially fixed), but it had other features like NOTHING else that small and lightweight at the time. 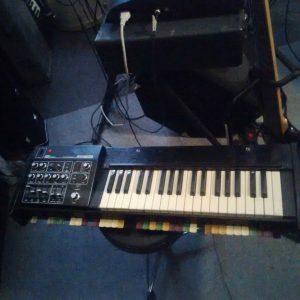 Everything I can think of (as an experienced keyboard guy), I checked. Portamento and noise generators all work fine. The VCF stage has some internal noise, much more than new, obviously, so it functions as a feedback oscillator when the Q is set high- this, to me, isn’t a bug, it’s a feature, and a fun one. 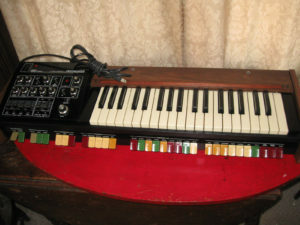 “Having a tidy up of my home studio so reluctantly selling this old classic synth that i’ve owned for 30 years. It’s in great condition for its age and never gigged. “Everything I can think of (as an experienced keyboard guy), I checked. Serial #255385, I haven’t been able to pin down DOM from that yet. 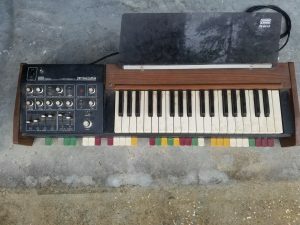 “This SH-1000 is in perfect working and very good condition!! This unit was overhauled by Roland professional technician. 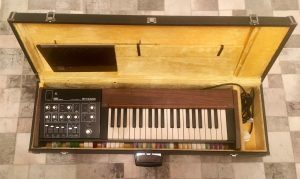 “Up for auction is this fantastic vintage Roland SH-1000 synthesiser. Cosmetically, it is in fair condition. However it must be understood we are selling this item as not working. It fires up and the power light comes on which is a very good sign. However, it does not make any sound. We believe the reason for this is because some of the preset rocker switches are disconnected inside the synth causing a break in the loop which forms the circuit to generate a connection. However, there may be another reason which we are not aware of. It should also be noted that there are some rocker switches missing (as shown in the photos) and there are five missing keys on the keyboard itself also. These keys can easily be found on eBay for around a fiver each. This will make a great project for an enthusiast or an engineer. The rocker switches and caps can be purchased at present from James Walker of Synth Repair Services while stocks last and indeed he is a very good engineer who may be able to help repair this classic synthesiser. 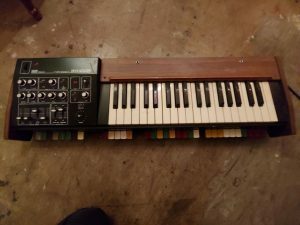 ” Roland SH1000 vintage synth in BRILLIANT condition. You can see from the photos that it’s in near perfect cosmetic condition, considering it’s age (almost 45 years!!) and the only serious defect it has is the address of the first owner scratched onto the bottom of the unit (I am the second owner). It’s never been gigged and has only had studio usage whilst placed in a synth rack. IT comes with original case too. “Roland SH-1000 Synthesizer. Made In Japan 1973. Plugged it in and it turns on but have no way of testing it so I’m selling it AS IS. The wood/body has some dings and left panel was glued. Selling as is. I know these are quite collectable as they are known as the first synthesizer out of Japan. 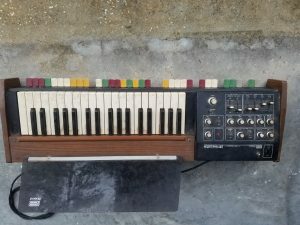 “This is an original vintage Roland SH-1000 Synthesizer. 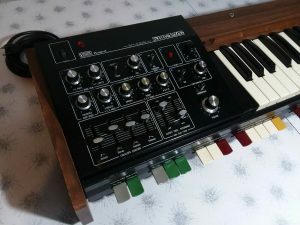 Roland’s first ever synthesizer, starting production in 1973. CONDITION: EXCELLENT. HAS NOT BEEN TAMPERED WITH OR MOVED AROUND IN YEARS. I GAVE IT A LITTLE WIPE DOWN AND IT LOOKS BRAND NEW. NO SCRATCHES OR MARKS, EVERYTHING IN TACT AS THE DAY IT WAS MADE. 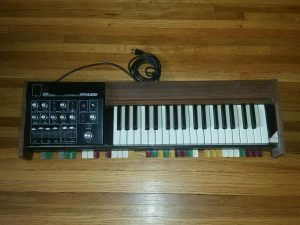 “This auction is for a Roland SH-1000 keyboard synthesizer. The unit turns on, all keys and knobs are intact, except for two tabs (see photos). The unit could use a tune-up. Some sounds work, some do not work. Sliders do not seem to make any difference. This unit has not been completely tested. I believe the unit can be repaired and used, not only for parts. This unit is being sold “AS IS” It includes the original box and plastic music stand. “USED Poland SH-1000 in great working condition. 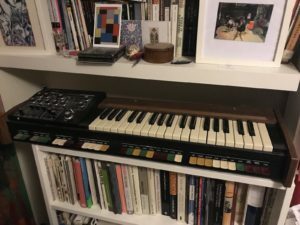 I’ve owned this synth for 10 years and had it serviced after first getting it. have a little look on you tube for people playing their sh1000 and you’ll get a better impression than what i can tell you. Or maybe you already know. they made an sh2000 after this one, which is nothing compared to this. 2 unique points about this particular one is that it has ALL its paddle switches (usually some if not all are broken) and it also has its original hard case, with a yellow velvetine lining! all of the keys are in perfect condition, with no chips or damage.